Confident your content is safe from pirates? Think again! There is no doubt about it, pirates are criminals. Unfortunately they are also entrepreneurs. They know that high quality, compelling content offered at a reasonable price sells! As such all legal content – thematic channels, recent movie releases, and particularly live sport – is a target. Unless investments are protected, content is not safe. As you know from my earlier post, we are facing a wave of piracy larger than ever before. Pirates offer a ‘plug & play’ philosophy with attractive, content rich subscriptions available from professional looking websites which offer support and money-back guarantees. And it’s working – it’s proving very successful… for the pirates. We’ve seen exponential growth of pirate OTT providers since November 2014. 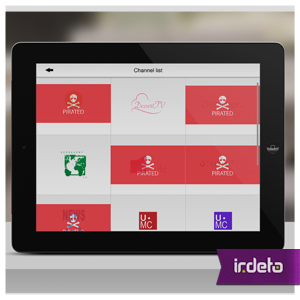 At that time, Irdeto was monitoring 198 pirate sites; by February 2015 this number had grown to 400. Double in 3 months! Of these sites, 268 advertise the channels included in their packages. For many of our customers, and indeed even prospective clients, we provide in-depth landscape reports which provide a detailed, tailored insight into OTT piracy as it affects them. Are you interested in knowing what your landscape looks like? Pay-tv platforms that don’t have the ability to match the source of an illegal stream to a smart card or OTT account, and cannot therefore switch off that source in real-time, are more vulnerable. Implementing a complete anti-piracy program is essential. Where broadcasters have invested in fingerprinting technology but not a meaningful anti-piracy program, their content is still available on multiple pirate packages. OTT piracy is a growing, pandemic problem affecting all global pay-TV operators, content rights holders and consumers. Pay-TV operators face the real threat of losing potential, and existing, customers to cheaper pirate services. For content rights holders this rapidly growing threat is diluting the value of their content and negatively impacting on their bottom line. The best way to keep content safe from pirates is to fight online piracy together. This entry was posted in Media & Entertainment and tagged Irdeto, online piracy, OTT, OTT piracy, pay-TV operator;, rights holders. Bookmark the permalink.